Leisure and Spirituality by Paul Heintzman. Grand Rapids: Baker Academic, 2015. 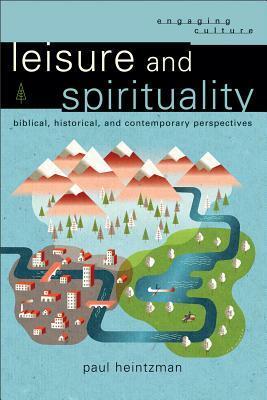 Summary: This book explores the connection between leisure and spirituality from a Christian perspective, considering contemporary and classical concepts of leisure, the perspective on leisure we may gain from the Bible, and the author’s own synthesis and critique of leisure concepts, biblical material and contemporary research. Leisure and spirituality. For some, the only relation between these two words is that of an oxymoron. And that may be our problem. Gordon Dahl, one of the early writers on leisure and play noted that most people, “tend to worship their work, to work at their play, and to play at their worship.” Paul Heintzman, a leisure studies professor at the University of Ottawa, has given us a measured, clear and thoughtful assessment of the contemporary, classical, and biblical material related to these ideas along with findings from contemporary research in this field. The book begins by exploring concepts of leisure and their contemporary expressions, outlining seven conceptions: leisure as a state of being, leisure as non-work activity, leisure as free time, leisure as a symbol of social class, leisure as a state of mind (flow experiences for example), feminist conceptions of leisure, and holistic leisure. He explores the history of the leisure concept which he sees expressed both in Greek and monastic Christian circles as contemplation, a state of being; and leisure as activity, the primary conception of leisure in the Reformation and Renaissance, conceiving of work as primary and leisure as restorative. Heintzman turns to the biblical material beginning with the commands around sabbath and its support of an egalitarian view of life, a rhythm of work and rest, and qualitative renewal and celebration. He explores the use of “rest” in the Bible and finds again a qualitative emphasis on the enjoyment of peace, abundance, and freedom, centered around a secure relationship with God in Christ. He then considers other related words, most notably the use of schole’ in the Septuagint translation of Psalm 46:10, rendering it, as Josef Pieper did, “have leisure and know that I am God.” which certainly supports a contemplative notion of leisure. He also notes in Israel’s festivals a more active expression of leisure. He follows this with an exploration of work in the Bible and its relation to leisure. In the concluding chapters of the book, he applies the biblical material to a critique of the different concepts of leisure, arguing for a holistic view that combines contemplative and active conceptions of leisure. He contends for an identity view with regard to a work-leisure ethic in which work and leisure are not fragmented into separate aspects of a life but experienced simultaneously by whole persons, where we “rest in our work”. He then turns to eight processes that have been found in research to enhance spirituality, considers how these help in coping with stress, and concludes with arguing for the mean found in the book of Ecclesiastes between hedonistic pleasure seeking and compulsive workaholism–the enjoyment of the goodness of our lives in rhythms of work and rest. This is an important work in several ways. I did quite a bit of reading on the theology of work in the 1980s, covering the ground Heintzman covers. What I discovered, and Heintzman confirms in his literature review, is that little has been written in this area since then and so this book explores work, rest and leisure for a new generation. In addition, Heintzman gives us a thorough and clear overview of conceptions of leisure including those of Veblen on the leisure class, and feminist perspectives, that might not be as commonly considered. What I found most valuable, however, was the latter part of the book where Heintzman gives his own critique and synthesis of all this material. The eight practices he advocates out of his research may be helpful for those who engage in spiritual direction or retreat planning as well as those leading recreation programs, particularly in Christian settings. Many of us still struggle with reconciling the ideas of leisure and spirituality. After reading Heintzman’s book, these are a bit less of an oxymoron for me. I just finished reading James Bryan Smith’s book The Good and Beautiful God that covers practical ways to incorporate spiritual disciplines into daily life. The last chapter covers the topic of this book. Sounds like another one for me to put onto my “to read” list. Thanks. I’d love to borrow this sometime!